I'm Ingrid and these are some of my stories, recipes, and other random thoughts, theories, and musings. I hope you find something you like! Jim, enjoying the benefits of sticking close to home. Does it really count as road tripping if you’re staying at your own house? Probably not. Although during this trip we did come from further south (Crystal Mountain), stayed at our house for two nights, and then continued along northwards to Mt. Baker, and we had our friends Hennie and Seth along too, so it did sort of feel like part of a road trip even though we slept in our own beds. It definitely rains all the time in Washington. Definitely. All the time. Stevens Pass is about a 35 minute drive from our house, so it’s sort of our home mountain in that we go there very often, but it feels new and different to me for a few reasons. First, I moved here a few years ago now but I’ve spent much of the last few winters either traveling, healing from an injury, having babies, or all of the above, so I’m still getting to know it. Secondly, the place is stuffed full of nooks and crannies, pointy little peaks, billygoat lines, and little chutes everywhere. 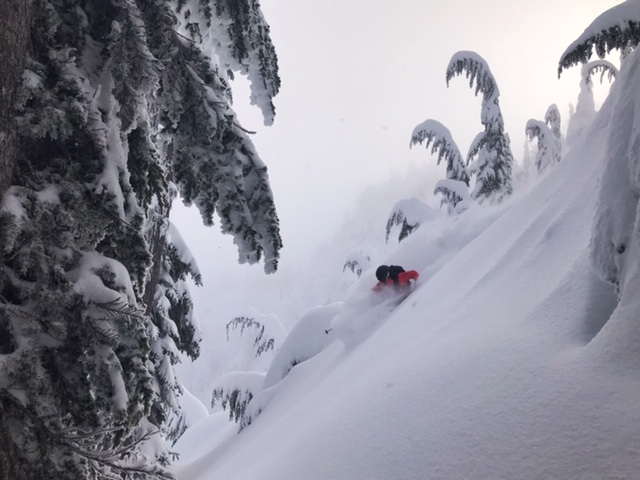 It’s classic PNW skiing in that it skis much bigger than it looks—it seems I can poke around endlessly and find new combinations of lines in places I swear I’ve skied a hundred times before. In other words, there’s a lot to get to know. My go-to run here is off of Seventh Heaven chair--exit the steep ramp at the top, traverse straight ahead until you like what’s below you, and drop in to your left. No matter which way you drop in, you’ll find a long, sustained leg-burner with interesting cliff bands and creekbeds, boulders for sending, and trees to poke around in. There’s a bonus groomer at the bottom to take you back to Skyline to do it all again. And if you have backcountry gear and know-how, the possibilities nearby are endless; www.nwac.us is a good place to start. Shredding through a Bob Ross painting. Getting there: Stevens is about two hours from the Sea-Tac airport with no traffic; it’s less from anywhere north in Seattle. Where to stay: Leavenworth, WA, an additional 35 minutes over the pass from Seattle, has lots of lodging if you want to make a weekend out of it (prices & traffic skyrocket during festival weekends like Christmas LIghting, the first three weekends in December, so definitely check leavenworth.org for events and schedules! ), otherwise the Stevens parking lot is another great spot for RV-ing, availability dependent, or there are a few motels/nightly rentals in Index, Monroe, Goldbar, or Sultan (30 minutes to one hour away). Food, Drink, & Notable Extras: The Sultan Bakery in Sultan, WA (if you’re coming from the west) has baked goods and ridiculously massive breakfast and lunch sandwiches. In Leavenworth, get coffee and breakfast biscuit sandos at Argonaut, and lunch/apres sandos and fries at Schnitzel Brothers. Hit the Icicle Brewery for beers and snacks, Blewett Brewing for good beer and great pizza, and the Munchen Haus for brats and pretzels. The Watershed has upscale local fare if you’re on a more fancy ski road trip; Yodelin has noodle and broth bowls and salads (plus burgers) in a casual atmosphere. Dan’s Market is the best place for groceries, fresh-baked bread, cheap deli sandwiches and breakfast burritos. Also, the cross country skiing at Stevens and in Leavenworth is not to be missed in my opinion; gorgeous, fun, and an awesome workout, plus just sketchy enough on the downhills to keep it exciting. The Leavenworth Ski Hill is an awesome place to take the family for Nordic or downhill skiing—they have two rope tows and a historic lodge (hot cocoa, fries, and local beer. It is one of my favorite places to go with our family anytime.